Home Matchday Match Previews ANOTHER BRIDGE THRILLER WITH VILLA? ANOTHER BRIDGE THRILLER WITH VILLA? Luis Felipe Scolari’s walking wounded welcome Martin O’Neill’s unchangeables this weekend, as Aston Villa – who have fielded the same XI in every Premier League game so far this season – come to the Bridge after a mid-week round of European matches. While the Blues were battling to a 0-0 draw against a stubborn and impressive Cluj in Romania, Villa played out the second leg of their UEFA Cup first round tie against Litex Lovech with similar consequences, drawing 1-1 but going through to the group stages comfortably on aggregate. It’s back to the bread and butter of the league though on Sunday, and with Villa flying high in third, expect action. Chelsea’s injury problems have been much-publicised, and indeed it seems as if the annual injury crisis starts sooner every year! Deco, Ricardo Carvalho and Michael Essien are definitely kicking their heels (if injury allows) on the sidelines, and the frustrated trio have now been joined by Didier Drogba. The Ivorian striker looked like an injury waiting to happen against Cluj, and in the end it was his knee which gave way, with ligament damage cited as the cause of the problem. Ashley Cole didn’t even make it on the field against the Romanians, with a pre-match back injury ruling him out, while John Terry complained of a back injury after the game due to the hard Transylvanian pitch. His partner in central defence Alex, meanwhile, needed attention for a buttock injury. It seems we are gathering so many injuries, even the silly ones start cropping up. With Villa’s interesting selection policy, that famous José Mourinho press conference can probably be recreated whereby the opposition team is named ahead of the game: Friedel, Luke Young, Laursen, Davies, Shorey, Barry, Reo-Coker, Petrov, Ashley Young, Agbonlahor and Carew. With only Wilfred Bouma and former Blue Steve Sidwell out through injury, O’Neill has no real worries. They boast the second-top goalscorers in all competitions with Carew and Agbonlahor tied on five and only behind Amr Zaki of Wigan, while centre-back and captain Laursen is always a threat from set-pieces. Last season saw a memorable afternoon at the Bridge between these two sides, with an unbelievable 4-4 draw and plenty of talking points afterwards. One of the contenders for game of the season began with Villa in the ascendancy, with Shaun Maloney (now departed and plying his trade for Celtic) putting the Midlands side 2-0 up inside the first 44 minutes. With the home record under threat, the Blues kicked into action seconds before the half-time whistle, with Michael Ballack (on as a substitute for the injured Frank Lampard) winning a debatable penalty under the challenge of Zat Knight – who was sent-off. Andriy Shevchenko sent Scott Carson the wrong way and gave Chelsea a glimmer of hope going into the interval. If the penalty was slightly fortuitous, the equaliser was nothing but class, with Shevchenko the architect. Kalou set up the Ukrainian who absolutely spanked a long-range shot into the back of the net, as a spectacular day got better and better. Alex, seemingly with both buttocks intact, put Chelsea ahead for the first time in the match with a low drive after swapping passes with Shevchenko, however Laursen soon levelled the scores with a goal from – surprise, surprise – a set-piece. 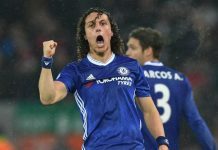 Ricardo Carvalho saw red for a horrible two-footed challenge on a counter-attacking Agbonlahor, but Chelsea were able to go ahead in the 87th minute with Ballack scoring a tremendous free-kick. The game was still far from over however, with Villa pushing for an equaliser at the death and Agbonlahor heading towards goal only for Ashley Cole to handball on the line. The England left-back received his marching orders, and Barry scored the subsequent penalty to earn Villa a deserved point and bring the curtain down on a fantastic game. 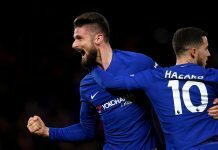 While you catch your breath, it seems a good time to bury bad news, and Chelsea’s recent record against Villa seems dodgy enough to sweep under the carpet. A bogey team in the making, especially at Villa Park, the Blues haven’t taken three points from a league game with the Villains since September 2005. Two Lampard goals cancelled out Luke Moore’s early opener on that day, but back in May 2002, Chelsea lost at the Bridge 3-1, with Peter Crouch and Darius Vassell scoring before Eidur Gudjohnsen got one back. Dion Dublin added a late third to complete a sorry day for the Blues. Chelsea’s injury problems and Villa’s ascendancy in the league could point to a tricky day at the office for Scolari’s side this weekend. The way things are going, there could be more injuries than goals on Sunday, but three points would be a good remedy for our ailments at this present time. Prediction: I’m going for a narrow win or a draw against Villa, seeing as they are a very good side and we are slightly depleted. If I was pushed, I would go for a 2-1 win. Chelsea play Aston Villa at Stamford Bridge on Sunday 5th October, with kick-off at 1500 GMT.